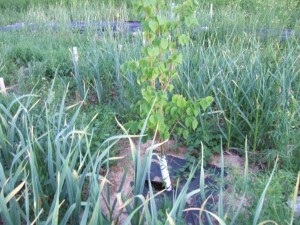 Here are some photos of the one acre demonstration food forest at Clear Sky in year one of its growth. It was planted in late April and early May 2013, with some additional planting of windbreak trees in October 2013. 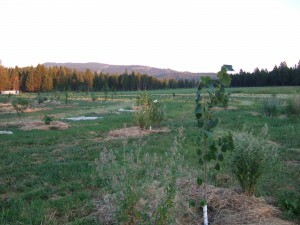 With only 6 months to get established, the food forest is doing remarkably well! 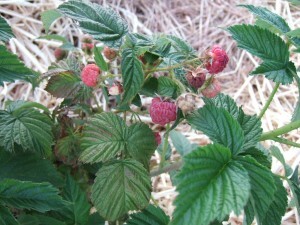 The raspberries already fruiting in their first season. 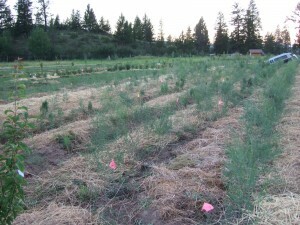 Asparagus in the food forest – about 4-5 months old. 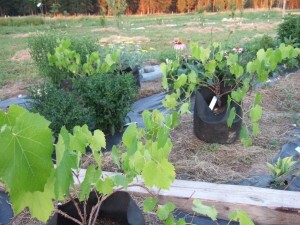 Broad view of the food forest, Catnip (the bees love it) next to Linden in foreground. 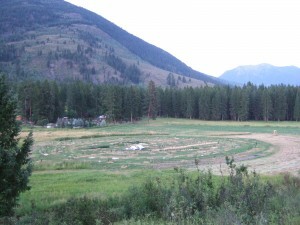 View of the food forest from above, about 3 months after planting. 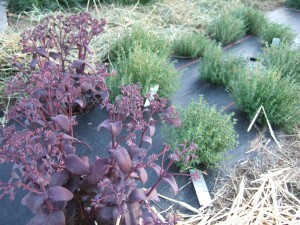 Some of the herbaeous material of the food forest in nursery beds. It looks like a sedum in the foreground and a vetch in the background. 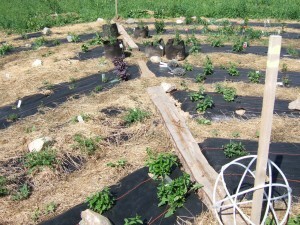 Nursery bed at the center of the food forest to care for young herbaceous and medicinal plants, about 3 months old. These will later be transplanted in to the food forest. hello farm fairies – what great pictures!! thank you for keeping us in the loop with these… you are doing such a fantastic job! wish i could be there and help a bit more. Thanks for doing this. Great job. This can help teach others that food forests can work in zone 4 too, and teach others in zone 4 what plants to plant in their back yard food forest that this should help inspire them to plant. Looks good so far, after it continues to do well in the next few years it’s going to be even more inspirational and educational. :D. Looking forward to videos of this food forest after it gets larger explaining what plants it has.